The Guinness Storehouse is one of the main attractions in Dublin and thousands of visitors come here every year. You can see how Guinness dark beer is produced here and learn more about its history. The beer has been brewed at this brewery since the 1700s and the popularity of Guinness never seems to fade away. The old historic building has seven floors and has been made attractive and interesting for tourists. After completing your visit, you can find out all about how beer is made and how production is done. There is of course a glass of Guinness (a pint) on entry, which you can enjoy on the amazing roof terrace from which you’ll have a great view of Dublin. St Patrick’s Cathedral is a very old church that is highly associated with legends and myths. According to tradition, St. Patrick, Ireland's patron saint, baptized the pagan Irish people here. There has been a church on this site since the 400s, but what you can see today stems from the early 1200s. The cathedral has been renovated and rebuilt many times and is a mix of different architectural styles. Like so many other old churches, throughout history it has been vandalized and left to decay. Among other things, it was used by Oliver Cromwell as stables for his horses during his visit in the 1600s. The area around the church is clean these days, and you can visit Jonathan Swift's grave and see his old inscriptions. Jonathan Swift was an Irish-British church priest, writer and satirist who was active during the 1600s and 1700s. Although it is slightly outside Dublin (about a half-hour bus ride), Ardgillan Castle still counts as a Dublin tourist attraction. The castle is huge and originates from the 1700s, with some later additions. Today, the first floor is open to the public and there are guided tours you can take to learn more about the castle. One can also sit in the nice surroundings and enjoy refreshments in the so-called "tea rooms" or walk around and explore the beautiful surroundings and parks. The Rose Garden is especially popular with its mix of colours and smells. There are also several nice bicycle paths and hiking trails around the castle. The landscape is very beautiful and you can easily get down to the beach. Trinity College is a university that was founded in the 1500s and has today become an incredibly popular place to visit. The buildings and surroundings are very beautiful and there is a lot for visitors to explore. There are self-guided tours for those who want to visit the library, where among other things you can see The Book of Kells. This book contains the four Gospels and other writings. These books, which are bound in four volumes, are very beautiful and ornate. It is believed that they are from the 800s, and they were written in different monasteries of both Ireland and England. There are also several exhibitions at Trinity College with different themes. It’s easy to feel as if you’ve entered a different world when you see this great library and campus. This oasis is situated in the middle of Dublin, in Phoenix Park, which means that it’s easy to reach from the central parts of the city. Dublin Zoo has tried to create an interesting zoo that reflects the animals' natural habitat. Here you can stroll through the African savannah with giraffes and zebras or visit Kaziranga, the forest where the Asian elephant herd roams around. You will find a wide variety of exotic animals, including red tigers, hippos, tigers and a variety of monkeys and gorillas. It also has regular organised activities, especially for younger visitors. Dublin Zoo has been around since the 1800s and does a lot to preserve endangered species and animals. Today there are about four hundred animals in the park. Ireland is known for its good whiskey and Jameson is one of the older and more popular whiskey varieties. Here one can visit the distillery and take a guided tour to see how this drink is produced and what makes it different from other whiskeys. Of course, you can taste the whiskey and they even give a certificate that it is the official Irish whiskey tester. After completing your visit, you can get a drink in one of the three bars available. Since there are different degrees of quality of whiskey in the same company, it can be quite interesting to see how the various beverages differ. There is also a very nice lunch restaurant called the 3rd Still Restaurant, which overlooks the distillery. Brazen Head has been around since 1198 and is officially the oldest pub in Ireland. This is where you can come to eat and drink plenty of typical Irish fayre. The pub serves both traditional and modern dishes. Beef Stew with Guinness is one of these on the menu. Every night they play live music which is usually very pleasant to sit and listen to. In fact, there are many lovely pubs in Dublin; it really is part of the culture to relax with friends and enjoy a drink. 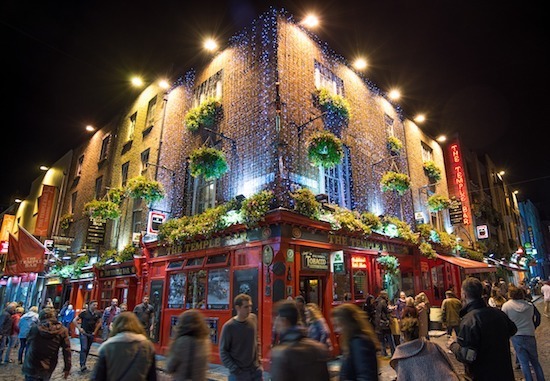 Dublin is known for its cosy pubs, especially in the Temple Bar area where there is always something going on and where you can easily meet with both local people and visitors. The area is especially popular amongst young people. It may sound strange that a post office could be a tourist attraction, but the General Post Office building is something extraordinary. It’s a very old and beautiful building from the 1800s, but it mostly has historical value. In 1916 there was a rebellion in Ireland, known as the Easter Rising, when the Irish rebels tried to gain freedom from the British government. The rebellion did not go well for the Irish and one of the leaders, James Connolly, took over the post office with a group of men and barricaded themselves there. When the British came and crushed the rebellion, many were injured or killed, but it still has an important place in the history of Ireland. You can still see the bullet holes on the post office's facade and the insurrection is portayed in several paintings inside the building.